June 19 is Founder/CEO Dawn Halfaker's Alive Day. Photo: Dawn with James Gandolfini on the set for his documentary with Iraq veterans, "Alive Day Memories." Gandolfini was active supporter of the Wounded Warrior Project. Dawn has served as the WWP's Chairwoman of the Board. Dawn's Alive Day is June 19, 2004. Note: My story on Dawn Halfaker written for Voice of San DIego in 2007. In sports, heroes, warriors and courage are words thrown around too loosely in an effort to explain that athletics build character. But Capt. Dawn Halfaker (U.S. Army retired), a women’s basketball star at the Army as a West Point cadet from Rancho Bernardo High, lived the ultimate definitions. On June 19, 2004, Halfaker (then a lieutenant) was the commanding officer in a military police platoon gathering intelligence in Baqouba, Iraq, a hot spot northeast of Baghdad. Halfaker and four soldiers were in an armored Humvee when insurgents fired upon them with a rocket-propelled grenade. The explosion left Halfaker’s right arm hanging from her shoulder by only the skin, the humerus bone having been blown away. She was covered with blood, her face was burned and she struggled to breathe, but she still had her West Point-trained presence of mind. Halfaker, fighting to remain conscious, gave orders. She saw that Staff Sgt. Norberto Lara, seated in front of her in the passenger seat, had lost his arm. “Get out of the kill zone!” Halfaker shouted to the driver. The driver found cover and medics arrived. She was bleeding and lying in dirt. As she was treated, she wondered about the condition of Lara and the others in the patrol. “Courage Under Fire” was the 1996 movie title of a fictional woman officer on the front-lines in command of men. Halfaker's story is the real deal, not a Hollywood script. She was rushed to a front-line military hospital and placed in a medically induced coma while clinging to life. Then she was sent briefly to an Army hospital in Landstuhl, Germany. Halfaker woke up 10 days later at Walter Reed Hospital in Washington, D.C., with her right arm amputated. She was one of the first American military women to lose a limb in Iraq combat. Halfaker, awarded a Purple Heart and Bronze Star, was confronted with a comeback unlike any she faced as a college basketball player or three-sport high school athlete. But at the same time, she remained attached to those team huddles at Rancho Bernardo and West Point. Halfaker was medically retired after rehab, and in January 2006, she founded her own security consulting company, Halfaker and Associates. She’s based in Washington, D.C., but the company also does business in Chicago, San Antonio and Mississippi. Sports gave Halfaker an identity in San Diego. She led Rancho Bernardo’s girls basketball team to back-to-back CIF San Diego Section Division I titles in 1996 and 1997. At West Point, she was a four-year varsity letter winner. 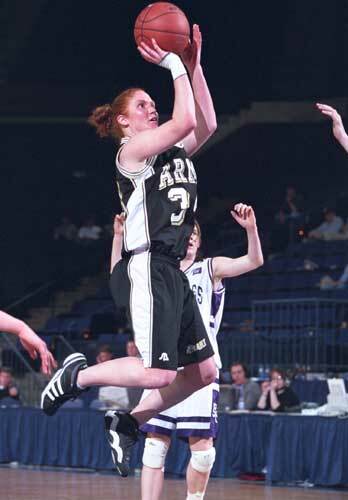 She still holds the Army record for steals in a season (85, 3.1 per game) and ranks second in career steals (222). If you accept the notion that the United States is a nation of reluctant warriors — we fight only as a last resort but respond fiercely when provoked — Halfaker’s story plays to the American theme. She’s not from a military family, and when Army recruited her to play college basketball, the 9/11 attacks and war on terrorism were conflicts in the future. But she served her country when called upon. Halfaker is among 26,000-plus Americans wounded in Iraq, and the comeback trail has been harder for some than for others. She said an important step to her recovery was getting back to work quickly. She was still in physical therapy when she accepted an internship with U.S. Congressman Duncan Hunter (R-Calif.) of San Diego. Halfaker, whose right-handed skills made her an elite athlete, now had to learn to do everything left-handed from brushing her hair to eating to getting to work. One way she thanks him is her work with the Wounded Warriors Project, a nonprofit organization that assists military personnel that have been wounded serving their country. She has served as a board member and last month was elected a vice-president. Despite experiencing the horror of war, it’s important to her to remain involved in military issues and have a role in the war on terrorism. Founding her security company keeps her connected. Her company provides experienced consulting on terrorism security and provides employment opportunities for wounded warriors and retired military personnel. She has twice testified before Congress and has been a guest on television news shows such as MSNBC’s “Hardball” with Chris Matthews. Her Congressional testimony on May 17 was before the Subcommittee on Economic Opportunity of the House Committee on Veterans’ Affairs. She’s also maintained her love of sports, competing in tennis and a soccer recreation league.